Scarlett Tohme1, Shangqing Jiang2, Amee Shah3, Lindsay Freud3, Giovanni Ferrari3, Emile Bacha3, David Kalfa3. 1New York Medical College, Valhalla, NY, USA, 2Columbia University Mailman School of Public Health, New York, NY, USA, 3Columbia University College of Physicians and Surgeons New York-Presbyterian Morgan Stanley Children's Hospital, New York, NY, USA. OBJECTIVE:The Ross procedure is considered to be the gold standard for aortic valve replacement in neonates/infants; however, there are few studies reporting outcomes of the Ross procedure in large cohorts of this population. 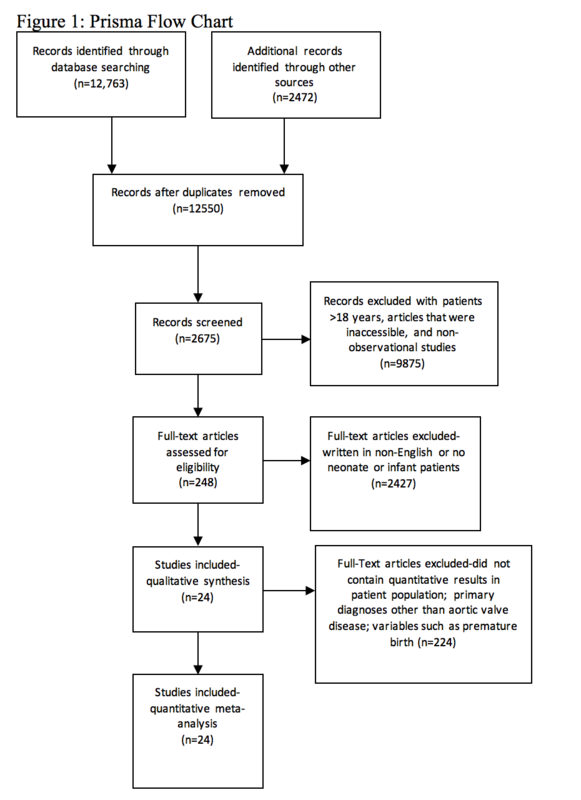 We performed a meta-analysis to compare early and late outcomes in neonate/infant patients who undergo a Ross/Ross-Konno procedure in the current era. METHODS:In accordance with PRISMA and MOOSE guidelines, we systematically searched Ovid versions of MEDLINE and PubMed using (“Ross”OR“Autograft”)AND(“Aortic Valve Replacement”) AND (“Neonate and Infant”OR“Infant”OR“Neonate”). Included were English-written observational studies presenting outcomes of the Ross/Ross-Konno procedure in neonates/infants including early mortality, late mortality, autograft and/or homograft reinterventions. Figure1 shows the PRISMA flow chart. Meta-analysis was undertaken in MetaXL add-in for Microsoft Excel using random-effect model combined with double arscine transformation. A point estimate of a pooled prevalence along with its 95%CI was calculated. RESULTS:24 studies were included in the metanalysis. The outcomes of 603 neonates/infants having a Ross/Ross-Konno were extracted and analyzed. Follow-up range was 5 days-23 years. 22 studies reported 104 cases of early mortality out of 567 neonates/infants and 39 cases of late mortality out of 418 neonates/infants. The estimated early mortality prevalence was 18.28%(95%Cl:13.55%-23.54%). The late mortality prevalence was 9.67%(95%CI:5.85%-14.27%). 17 studies reported that 74 out of 380 neonates/infants presented with autograft failure, defined as greater than moderate stenosis or regurgitation. The estimated autograft reintervention is 20.27%(95%CI:7.74%-36.40%). The estimated prevalence of homograft reintervention is 32.03%(95%CI:20.98%-44.18%). CONCLUSIONS:A neonatal or infant Ross procedure still carries a significant risk of mortality in the current era. Studies of neonatal/infant Ross patients with longer follow-up are warranted to investigate the rate of autograft reintervention and the impact of the Ross on long-term survival.